Burger chain Carl’s Jr. said Wednesday it will test a CBD-infused cheeseburger for one day — on 4/20, of course — at one restaurant in Denver, and in time for breakfast. The burger, which will be called “The Rocky Mountain High: CheeseBurger Delight,” will feature two 100% charbroiled beef patties, topped with the chain’s Santa Fe Sauce mixed with CBD oil. It will also feature pickled jalapeños, pepper jack cheese and the chain’s Crisscut fries, all between a premium bun. 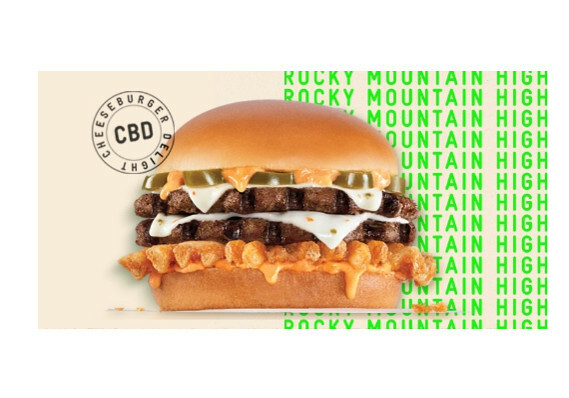 It will be sold only on April 20, which is widely accepted as the counterculture holiday for marijuana enthusiasts, at only one Carl’s Jr. restaurant, located at 4050 Colorado Blvd., in Denver. The burger will be available starting 6:00 a.m. Mountain Time, until closing time. The price will be, little surprise here: $4.20. “The new Rocky Mountain High: CheeseBurger Delight ties back to our core strategy of being the first to bring bold and unexpected flavors that are at the forefront of hot restaurant trends to a quick service menu,” said Patty Trevino, senior vice president of brand marketing. Colorado is one of 10 states where recreational marijuana is legal, but there is some confusion over the legality of CBD. Cannabidiol, known as CBD, is a non-intoxicating cannabis ingredient. It is approved by the Food and Drug Administration for treating epilepsy. But the FDA still considers CBD as a drug ingredient, and therefore it is illegal to add it to food and health products without approval. Don’t miss: FDA warns companies to stop making ‘unsubstantiated’ claims about CBD curing cancer and Alzheimer’s. “We have reviewed the issues surrounding hemp-derived CBD oil and will be offering it on 4/20 at one location in Denver, a city which has been a trailblazer in the CBD movement,” said a Carl’s Jr. spokesperson said in an emailed statement to MarketWatch. Carl’s Jr. is a wholly owned subsidiary of privately held CKE Restaurants Holdings Inc., which is also the parent of the Hardee’s restaurant chain. The CBD burger announcement comes as the ETFMG Alternative Harvest exchange-traded fund MJ, +0.35% has rallied 37% year to date, while the S&P 500 index SPX, -0.21% has climbed 16%.